A Brief History of The Lodge Originally constructed in 1899 by the Alamogordo and Sacramento Mountain Railway as a by-product of the railroad’s search for timber and railway. Originally constructed in 1899 by the Alamogordo and Sacramento Mountain Railway as a by-product of the railroad’s search for timber and railway ties, the resort of Cloudcroft became immediately successful mountain retreat…a cool reprieve to thousands of overheated Texans. (Remember that New Mexico, Oklahoma and Arizona were not states at the time.) Owned and operated by the railroad, the resort’s initial building was a pavilion, now The Pavilion Bed and Breakfast at The Lodge with reception and ballrooms. In 1908, the El Paso and Southwestern Railroad System, the resort’s new owner, advertised that the hotel, restaurant, dancing pavilion, tennis court, golf links, bowling alley, billiard parlor, burro trips and children’s playground were accessible for weekend rates of $3.00 round trip. Lodge rates were $12.50 and up per week. 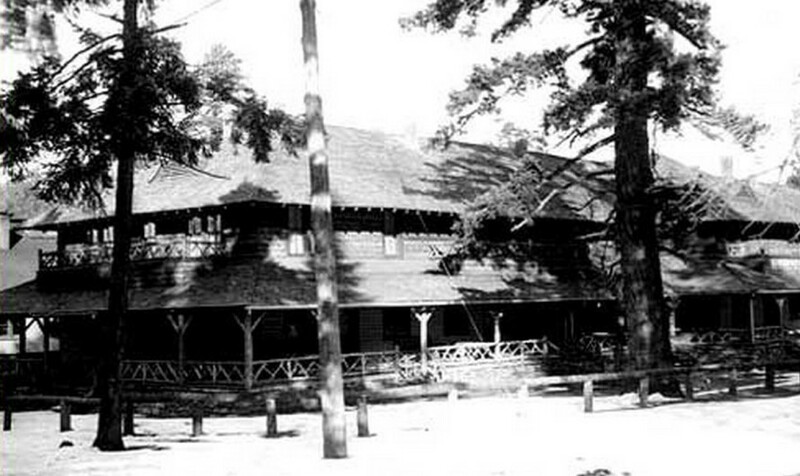 On June 13, 1909, a disastrous fire destroyed The Lodge. But by 1911, The Lodge had been rebuilt and reopened on its current, more scenic site. Since then it has undergone numerous renovations, but the initial appearance remains almost unchanged. Over the history of The Lodge, thousands of Southwestern families have called The Lodge and Cloudcroft their second home. The Lodge has entertained and hosted hundreds of politicians, artists, entertainers and business leaders, including such notables as Pancho Villa, Judy Garland and Clark Gable. Gilbert Roland was known to frequent The Lodge. Both U. S. and Mexican government officials have long visited the historic hotel. Military leaders, scientists and astronauts from all over the world have made The Lodge a retreat during their visits to White Sands Missile Range, Holloman AFB and Fort Bliss. And, in fact, the most famous hotelier in the world was once associated with The Lodge, with Conrad Hilton as its manager in the 1930’s. In January of 1986 the historic Lodge was purchased by Great Inns of the Rockies, Inc., a small privately held corporation. They operated the property successfully for 29 years. As of March 2015 The Lodge entered a new era of ownership by New Mexico Adventures, LLC a company owned by Lanna & Joe Duncan of Fort Davis, Texas, who have a 25 year history in historic hotels ownership & preservation in West Texas. They are committed to The Lodge tradition of friendliness, hospitality, outstanding food & unique lodging. Click here to download the history of The Lodge in .pdf format.